The end of 2016 saw a major political change, with billionaire American Republican businessman Donald Trump beating Hillary Clinton to become the 45th President of the United States. Trump is quoted to have said that Facebook and Twitter helped him win the election, with the President having taken on a distinctively raw and outspoken approach to his social marketing messaging that continues to this day. tag key influencers e.g. 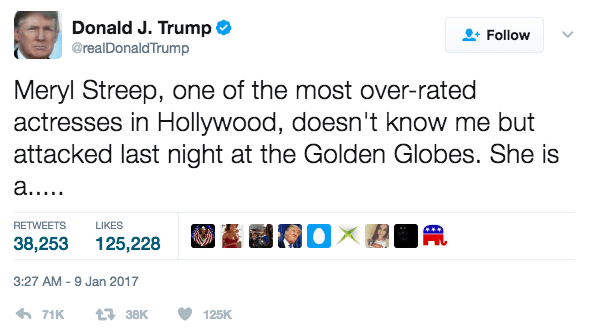 @GoldenGlobes (Meryl Streep’s absence of a Twitter account may be a blessing here) to get yourself (even more) noticed. Use relevant hashtags that are appropriate to you e.g. #JealousofMeryl or #IWillBeTheBiggerPerson. 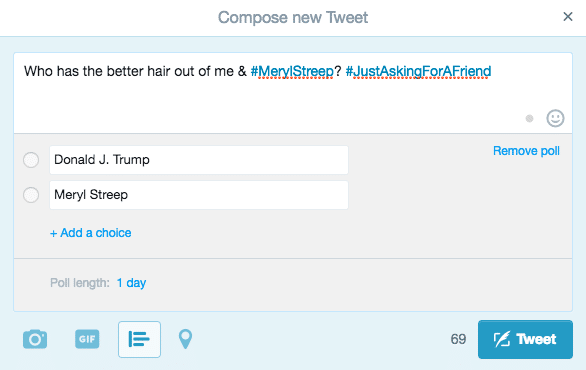 Run a Twitter poll to interact with your audience to try to understand their opinions e.g. Try to refrain from posting tweets that can be deemed offensive to your audience, such as being derogatory against a religion. This is a big no-no, and a surefire way to build the deep (very deep) foundations of your negative reputation. If you’re a business, a negative reputation = lost sales, which will get you into trouble very quickly. Nowadays we don’t go online, we live online. Being active on social media propels your business out there, gives brilliant brand awareness, builds genuine relationships with your customers, and allows you to jump in on the conversations that will get your business noticed (and for all the right reasons). Whether you want to open your first business Twitter account, or want to brush up on your social campaign skills, we have an expert team of social media Professors on board at our sister company GIANT Campus. Choose from Beginner Social Media Training or Advanced Social Media Training to suit your needs and get yourself socially savvy. 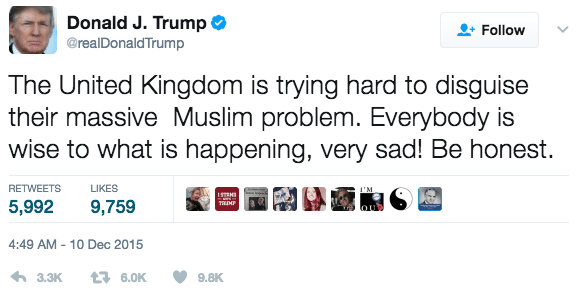 But before you go, we’d love to know if there are any Donald Trump tweets which have particularly caught your eye. Tweet us @SleepingGiantM!